Lena grew up around flooring and design. Her father owned a flooring company and her mother was a designer. Lena's mother operated a custom drapery and window treatment workroom in Statesboro, GA, so she grew up around home design. For the past 40 years, Lena has worked in flooring, design, construction and real estate throughout Atlanta and the Southeast and has been a Design Manager for several production and custom builders. Working with competitive baton twirlers and dancers, Lena is a certified teacher and judge. Many of her former students hold both state and national titles. Lena and her husband have been living in Gainesville for the past 20 years. She enjoys spending time with her daughter, Bridget, who lives in Buford with husband and her two grandchildren, Tommy and Brooke. Barbara Grant joined our company in September 2012, as a result of the efforts of Phil Bonelli, a past president of the Kiwanis Club and Jason’s best friend! Phil thought Barbara’s proven talents in accounting and operations would be a perfect match for the position of Controller of the company. In addition to her position with us, Barbara is also currently the Executive Director of the Kiwanis Club of Gainesville, a position she has held for thirty five years. Prior to joining us, Barbara was the Vice President of Operations and an owner in HERITAGE, REALTORS in Gainesville and SHIELD, REALTORS in Clarkesville. She is currently an investor in Keller Williams Realty Lanier Partners, the real estate market leader in Gainesville. Barbara enjoys spending time with her family and is the proud “Nana” of three exceptional grandchildren. When Karen left the corporate world in 2003 and joined the team at Budget Carpet and Flooring, her enthusiasm and spirit were contagious. Customers love Karen and she thrives here! She has acquired a very loyal group of repeat customers that come back just to work with Karen. 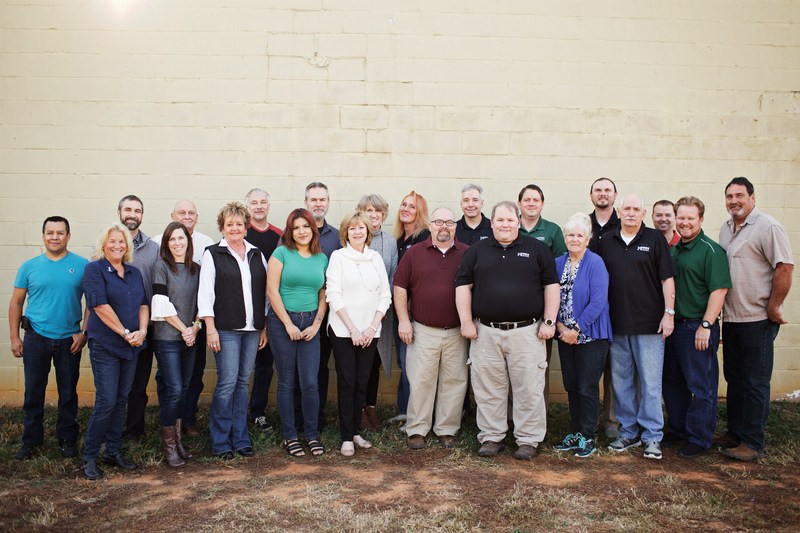 What Karen appreciates about Gainesville Flooring is the continued family-owned culture that has made it a friendly, flexible and pleasant place to come to every day. Spending time with her daughter, Margaret, and husband, Phil, on the farm with their horses and black lab, Jesse, keeps her very busy when she isn’t on the sales floor. The only drama her teenage daughter, Margaret, brings to Karen’s life is through all the singing and drama practices she is involved with! Karen was close friends of Jack & Brenda Everett years before coming to work here and their daughter, Margaret, even caught the bouquet at Jason’s wedding. They say business is made on the golf course, so we’ll be doing just fine with Nick on our team…he was in the golf business for 9 years, including 4 years as a golf pro! His background and knowledge of transportation and logistics continues to serve him well at Gainesville Flooring. His friendship with Tony and Jason is what led Nick to join our team…and we are happy he did! A native of Hall County, Nick has spent his entire life here and he attended North Georgia College. Nick is a former member of the South Hall Rotary Club and the former Vice Chair of The City of Oakwood Planning and Zoning Board. Besides loving the outdoors – biking, kayaking and camping, Nick and his wife, Megan, have a son named Thomas that keeps them both very busy. Brock is a life-long resident of the Gainesville/Hall County area and graduated from North Hall High School before going to University of North Georgia. He currently lives in the Mossy Creek area of White County. He joined Gainesville Flooring after many years of traveling North America selling industrial equipment and most recently, the Logistics industry. Brock enjoys playing golf, traveling and spending time with his family. He and his wife, Shanna, who is a school teacher in White county, have 3 kids: Gentry, Grant, and Nix. Andrew is a lonesome Alabama fan amidst the many Bulldog fans here at Gainesville Flooring. Before joining our team, Andrew spent the previous 25 years as a professional photographer working for clients such as TIME, Sports Illustrated, Rolling Stone, Fortune, NFL, US Navy & Marines, NY Times and Capital Records. His photography has been exhibited in the Smithsonian Institute, Birmingham Civil Rights Museum and the Alabama State Capital. His calm demeanor was probably a great asset as he taught photography at Auburn University. Meeting Andrew, you would never expect him to have shot so many famous people through his camera lens because he is such a down to earth person. Andrew and his wife have a daughter that is now his “focus” of many of his pursuits these days. Chris’s background in retail management, coupled with his experience on the distribution side of tile, brings a healthy supply of knowledge and organization to our flooring family. When he’s not in the office, he enjoys hanging out with his wife and son or playing online with his friends saving the world, one video game at a time. Alan has been in Hall County for over 20 years and he attended both Gainesville College and the University of North Georgia. Alan is a board member of NEGTA, the local USTA affiliate and former chairman of the Hall County Young Republicans. Besides playing and helping Tennis grow in our county, he and wife Andrea have 3 children which keep them just as busy at home as he is at work! John recently joined our team from being a sub-contractor in the building industry. For over 25 years, John spent his days trimming custom homes in North Georgia. John believes being part of the Gainesville Flooring team is more than just selling tile, carpet and wood flooring, it’s about being part of a group of people that takes pride in the entire customer experience – from start to finish. He and his wife, Sandy, have lived in the Hall County for many years and he enjoys spending time with family…especially his four grandchildren, Joleigh, Beau, Breck and Colton. John also enjoys traveling on short-term international mission trips with his church. Along with Jack back in 1992, Brenda was committed to making their new business venture, Budget Carpet, successful. While Jack worked on selling carpet and getting the word out about his new store, Brenda worked at Scientific Games programing and auditing. She would drive up to Gainesville from Flowery Branch at lunch a few times a week to check on Jack and see how the new business was progressing. A lot has happened since those early days. With the tenacity of her Great Pyrenees dog, Sarah, Brenda makes sure all our bills are paid and payments are received. This is a tough job, but Brenda makes it easier on all of us by being so good at what she does! When she isn’t on the farm tending to her and Jack’s 5 dogs, 5 cats and 10 horses, she can be found at the store or maybe up in Hiawassee visiting her brother and cousins. Though Donna would rather be at the beach since she grew up in south Florida, most days she is the other half of our wonderful team at Gainesville Flooring that keeps our products ordered, bills paid, installers paid all with a smile on her face. She is a busy woman! Donna is always happy and is one of those people at the store that knows a little bit about everything. After being a carpet installer for 20 years, Jack decided it was time to start his own operation and opened the doors to Budget Carpet Outlet. Using his strong sense of craftsmanship and years of relationships inside the flooring business, he set out to build a family owned business that exemplified fairness, integrity and service. Jack is “supposedly” retired these days, but can be found leading projects around the building, checking on jobs, meeting with contractors and offering advice to the next generation, his son, Jason. He has another grandchild due this April, so we know he will be sitting on cloud nine for the balance of 2017. You might say Jason has flooring in his blood… rolling carpet for extra cash in high school and working at his dad’s store to help pay his way through college. After completing his degree in Marketing/Business Administration from the University of Georgia, Jason’s dad passed him the flooring torch. He spent his first years out of college taking Budget Carpet & Flooring to the next step- moving into a bigger location, focusing on growing sales and utilizing technology. Now, 18 years later, Jason is the “go to” guy when you come into Gainesville Flooring. He is usually talking on the phone, helping a customer and answering questions from his sales team- ALL at the same time! His love of travel and adventure is a constant compass for what he might be doing next – a trip to Africa, an adventure race or maybe a hundred mile run… or just taking his two kids, Hudson and Harper, to Disneyland. Allyson works on marketing, merchandising, social media, website and special events for Gainesville Flooring and Gainesville Design Center. She spent 17 years in Marketing & Product Development in the art & framing industry prior to joining her husband in his flooring business. She loves to travel, get outside with her family and utilize her creativity in any project she is involved with. Allyson & Jason met on the last day of college at the University of Georgia thanks to their Professor, Dr. Sandy, taking their final marketing class out for a round of drinks!